There is one big industry event that every marketer eagerly anticipates every year. 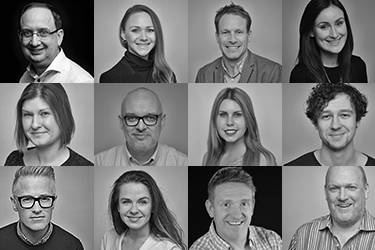 Marketing Week Live features two jam-packed days of exhibitors, innovation and expert talks. Taking place at Olympia London, Marketing Week’s Mark Ritson and former Saatchi & Saatchi CMO, Micky Denehy, were just some of the biggest guest speakers to make an appearance. During his talk, ‘Fostering Loyalty in the Age of Promiscuity’, Micky Denehy discussed every marketers struggle to get customers to have a genuine emotional connection with their brands. With over 30 years of industry experience and a self-proclaimed passion for, “People and brands”, he shared his thoughts on consumer loyalty and emotional connections in today’s world. 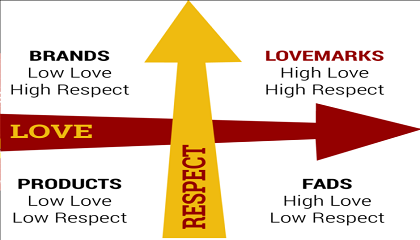 Lovemarks are determined by a simple love/ respect axes (see article image*). Denehy gave an analysis of the kind of products and brands that can be found in each corner of the axes. Low love/ low respect: These are found at the bottom left of the axes and are the products customers do not really care about. For example, when a customer goes into a hardware shop to buy nails and screws, these purchases require no thought and are usually just impulse buys. Low respect/ high love: Welcome to the world of fads. These products are usually found in the bottom right-hand corner of the axes. Remember Tamagotchi’s, Furby’s and Beanie Babies? Whilst these were once a customer’s pride and joy, they are usually just a, “Quick buck” for brands and not a long-term solution. High love/ high respect: Found in the top right of the graph, these brands deliver as they promise and have the ability to engage genuine affection. These are Lovemarks. He used two examples to highlight just what Lovemarks are. A Suzuki motorbike and a Harley Davidson motorbike. Suzuki has better product performance, is faster, better for the environment and should any problems arise, it is easier to get parts for. A Harley Davidson is slower and overall, its performance does not match a Suzuki. If a consumer was to buy a motorbike rationally, then a Suzuki is a better buy. But, Denehy points out, “Once you buy a Harley, you will never leave a Harley. You are hooked for life”. It’s not the performance that a customer looks for when buying a Harley, it’s the fulfilment of the senses. It’s the feel, sound and smell that touches a customer’s heart. A customer will forgive a Harley when it breaks down. They will not forgive a Suzuki. Why? Because customers have an emotional connection with a Harley. To really foster loyalty and get that real emotional connection, brands must start thinking about human relationships and not just transactions. Take a look at Yakult's 'A little culture in every bottle' promotion to coincide with the brands 80th birthday celebrations. This campaign brought emotion to the purchase offering every customers the chance to redeem a free six-month culture pass to some of the UK and Ireland's top historical and cultural attractions. The reward not only appealed to Yakult's predominantley 30+ customer base, but the creative and reward idea also matched the product. The good bacteria in Yakult is often referred to as culture, hence the headline, "A little culture in every bottle". 'Story telling' has become the new buzzword and people are now driven by experiences as opposed to material possessions. Brands need to be concious to the fact that unless they bring that brand story to life for their consumers they will find it difficult to stand out and inspire any sort of call to action. As the original story-doers, TLC Marketing have helped shampoo brands give away free haircuts and deodrant brands give away free fitness sessions. In doing so, they've increase brand NPS, shelf space, basket spend and retention. Speak to our PR and Marketing Manager, Emma Critchley if you would like more details on the campaigns we've run and how they have performed. Top Trends 2018, are you ready to play?